A query is asking something… Would you be interested in looking at my work? Why should a publisher (or agent) read your book? Why should a reader be interested in your book? According to Mr. Braunbeck a cover letter should include 5 parts, or what he calls the AIDA plan. So with that thought in mind, a cover letter should range from about 5 to 6 paragraphs long to show the publisher a true representation of your novel and your intentions. But make sure letter doesn’t go longer than one page! We met at (insert name of place met) and I pitched my novel (insert novel name) during dinner. You sounded eager to read it, so I am submitting my novel to be reviewed and considered for (insert name of publication) at your convince. I read on your website (or wherever you found the listing) that you’re interested in female-oriented fantasy. I think that (name of novel), the first of a detective fantasy series, might interest you. While both are acceptable ways to start a cover letter, I think you’ll agree the first one will get more personal attention than the latter. So that counts for your first paragraph (Attention), now let’s look at the second paragraph (Interest). The best way to drum up interest is to use a story hook to get the publishers attention. And a good way to do that is to ask questions that will peak their interest. What if you suddenly have a largely unknown, potentially unlimited power? What if that power just might eat your soul for breakfast, lunch and dinner? What if every magical mobster and sicko sorcerer in town wants that power? And what if you can’t get rid of it? Next up is a little more detail (but still just an over all summary of your novel). This part is still considered the Interest of the cover letter. That’s Raine Benares’ problem. She’s a Seeker — a finder of things lost and people missing. Most of what she’s hired to find doesn’t get lost by itself. It has help. Dependable help. I’m so tickled. I love the phrase “most of what she’s hired to find doesn’t get lost by itself.” Help she can depend on to use blades or bolts or magical means to keep what they went to all the trouble to get. Perfect fun tone (which matches the novel she wrote). I know this isn’t epic fantasy. It has an urban, lighter feel yet I’m getting all the necessary information about the main character and the role she is going to play in the story. When her sometime partner steals an amulet from a local necromancer, Raine ends up with the amulet and the trouble that’s hot on its heels. What looks like a plain silver disk turns out to be a lodestone to an ancient soul-stealing stone, a stone that seemingly every magical mobster in the city wants — as well as a few heavy-hitters from out-of-town: goblins of the Khrynsani Order, their sadistic high priest, Guardians of the Conclave of Sorcerers, the goblin king and his renegade brother, and an elven spellsinger of dubious motives. Then there’s what the amulet is doing to her. New and improved magical abilities sound good in theory, but Raine thinks her soul is a little much to pay for resume enhancement. More story conflict info but notice Lisa sticks with the tone she adopted. It’s not repetitive yet adds some depth to the story. And when she tries to take the amulet off, the amulet tries to take her out. Very hard-boiled sounding Soon Raine starts to wonder if her spells, steel and street smarts will keep her alive long enough to find a way to get rid of the amulet before it, or anyone else, gets rid of her. And the worst part? She isn’t even getting paid. It’s enough to make a girl consider a career change. Now what makes you as the author attractive (Desire)? Thief of Souls is my first novel. I’m an editor at an advertising agency, with prior experience in corporate communications and marketing. Just make sure to keep this paragraph brief and to the point. Don’t play up credentials you simply don’t have. And adding a little tidbit to help personalize you to the publisher is fine, if it’s kept very short. I’d be glad to send you my complete manuscript for your review. Thank you for your time and consideration, and I look forward to hearing from you soon. Make sure to put in the length of the novel somewhere in the cover letter. Make it as easy as possible for the publisher (or agent) to contact you. Don’t muddle up the cover letter or synopsis with character names and places. Just give a feel for the story, don’t get too deep. And lastly but most important, this letter is an introduction to your writing style, so make it shine! 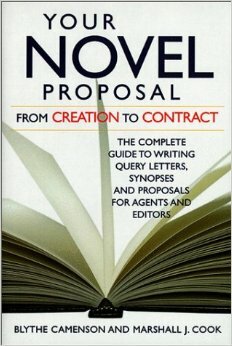 And also check out Your Novel Proposal from Creation to Contract by Blythe Camenson and Marshall J. Cook. Now onto the synopsis in Novel Submission: Creating Multiple Synopses.